Singapore introduced its first Protection from Online Falsehoods and Manipulation Bill on Monday (April 1), which Parliament is set to debate in the coming months. The proposed law is meant to protect Singapore from societal damage caused by falsehoods spread by “malicious actors”,� The Straits Times� (ST) quoted the� Ministry of Law as saying. This includes fake news that compromises Singapore’s international relations and racial and religious harmony, or that influences election outcomes. The Government defined a falsehood as information written as though it is a statement of fact, but is actually false or misleading. ST reported that examples of such statements include claims� (if proven false) such as “The Government has declared war against Singapore’s neighbours” or “Foreign workers vandalised several places of worship across Singapore”. Those found� deliberately spreading falsehoods online face fines of� up to S$50,000, a maximum jail term of five years, or both. Those who use online bots to boost the spread of these� falsehoods face fines of� up to $100,000 and jail terms of up to 10 years. However, those who� innocently forward fake news articles on platforms like Facebook or WhatsApp will not be will criminally liable, but will have to remove or correct the information, ST� reported. Under the Bill, ministers will decide if something is a falsehood and damaging to society. Each minister will deal with falsehoods that fall under his ministry’s domain. For example, fake news about bus fares will come under the Transport Minister, and falsehoods about school admissions will come under the Education Minister. The minister will then work with the Info-communications Media Development Authority of Singapore� to ask the account or site to take down the content, or issue a correction. Ministers can also order sites and accounts to be blocked. 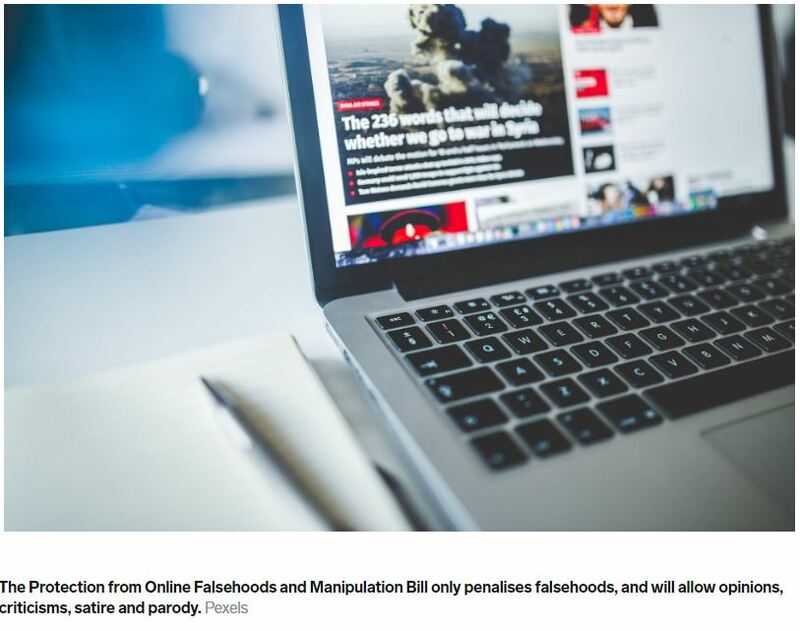 The Bill only penalises falsehoods, and will allow the public to continue publishing� opinions, criticisms, satire or parody. It will� not penalise those criticising the Government, as long as they do not make false claims, ST reported. Examples of statements that will not be policed under the proposed law include opinions such as “the Government is to blame for rising inequality” and “Singapore’s institutions and policies are often elitist”.